Gather all your friends and family for appetizers or happy hour and cook a batch of onion rings in the air fryer. 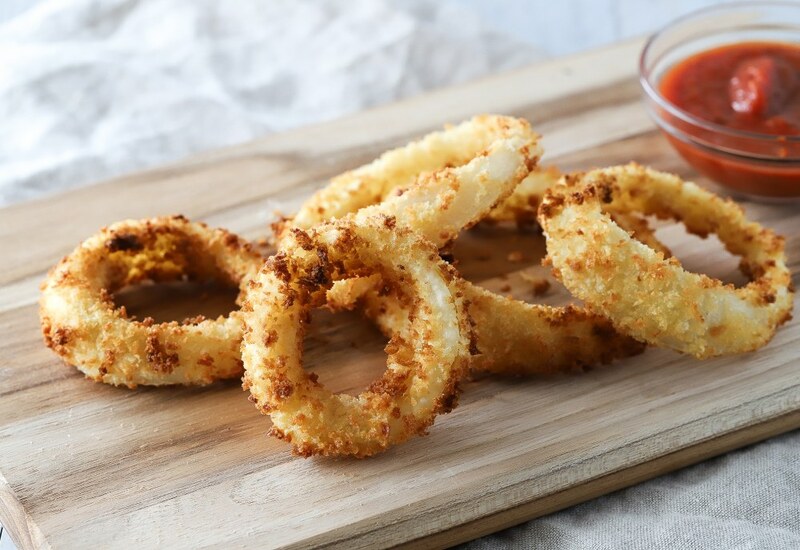 Each batch only takes 9 minutes in the air fryer and you will have crispy-on-the-outside and tender-on-the-inside onion rings. Serve them with your favorite dips, like Sriracha, blue cheese dressing, or ketchup and glass of beer or soda water. You can place the smaller rings inside the bigger rings in the air fryer, as long as there is space between them. Per Serving: 139 calories; 2g fat; 25.6g carbohydrates; 5g protein; 24mg cholesterol; 273mg sodium. I am an onion ring junky and was so happy when I found this recipe. I have been trying to cut back on my fried foods and thought for sure I would have to sacrifice my onion rings but not any more. I love making these and putting them with a nice juicy burger. I have been roaming the internet looking for recipes to try out in my new air fryer and found these onion rings. This recipe was super easy to follow and they came out great. I used seasoned Panko bread crumbs and served them with a chipotle fry sauce.